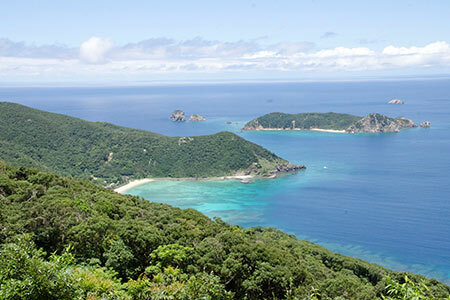 Ayamaru Cape has a spectacular 360° view from its highest point. 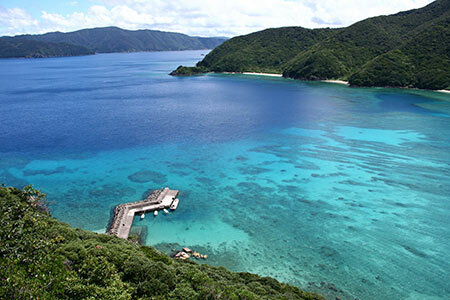 You can marvel at the breathtaking coastline of northern Amami, which gently slopes to the sea and is surrounded by coral reefs. 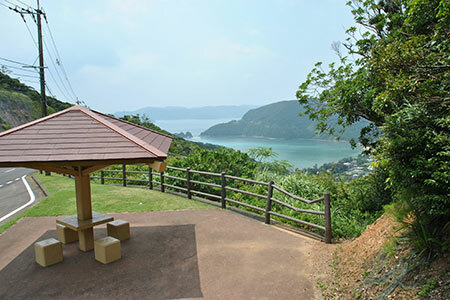 The cape is named after its unique, rounded hills that resemble temari, decorative balls of twine that are a traditional Japanese handicraft. 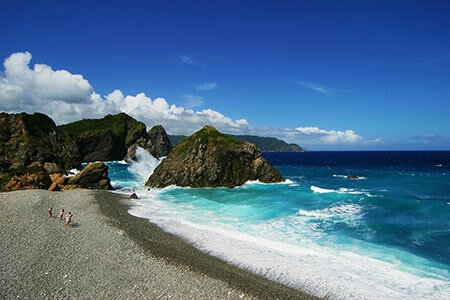 In the local dialect these are called ayamari. 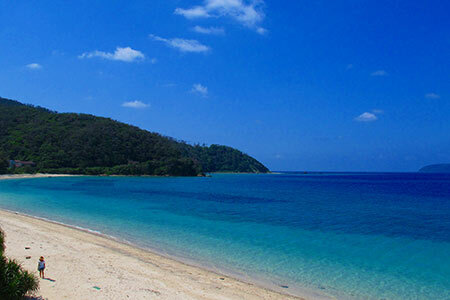 With its coral reefs and shallow blue water, Tomori Beach is one of the most beautiful spots in northern Amami Oshima. 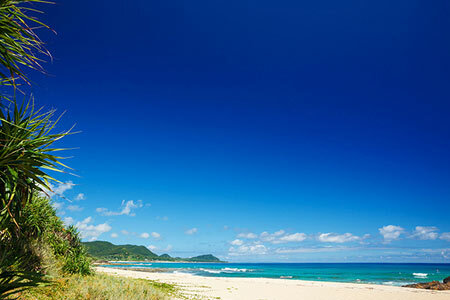 The view from the beach is so iconic that almost every tourist comes to marvel at it and take a picture of it. 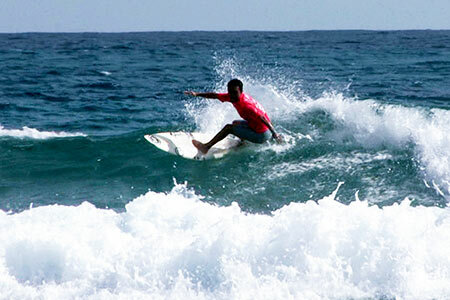 Tebiro Beach is one of the best beaches for surfing. 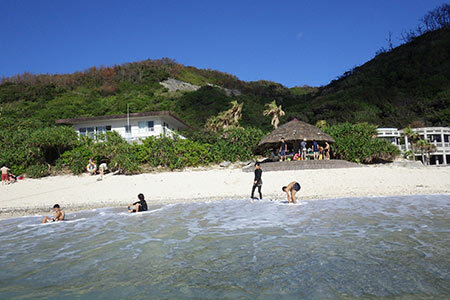 Popular with both locals and tourists, it is the main attraction for surfers who visit Amami. 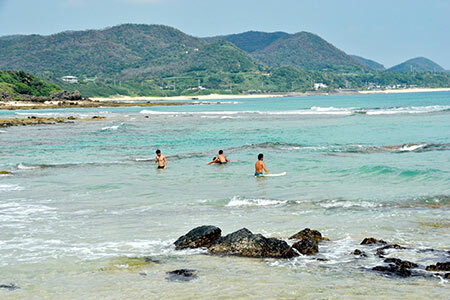 Paddle out beyond the reef and you can catch great waves from the Pacific Ocean. 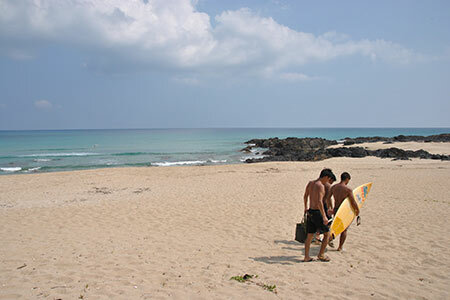 Surf shops are available nearby. 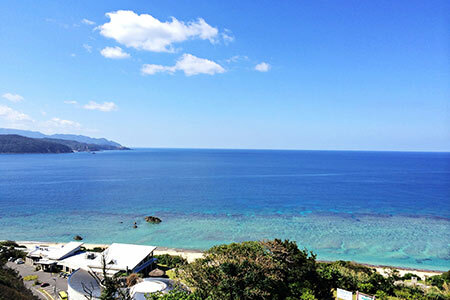 Lovely Kurasaki Beach is located in a resort area within Tatsugo Bay, where you can find a variety of accommodations and enjoy marine sports such as snorkeling, diving, kayaking, jet skiing and fishing. 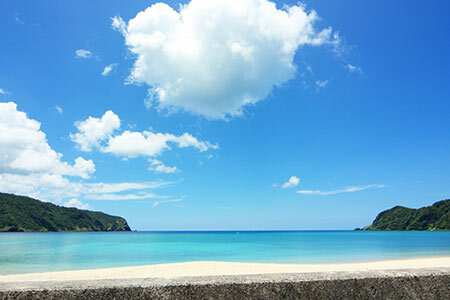 Ohama Beach is just a short drive from Amami City. 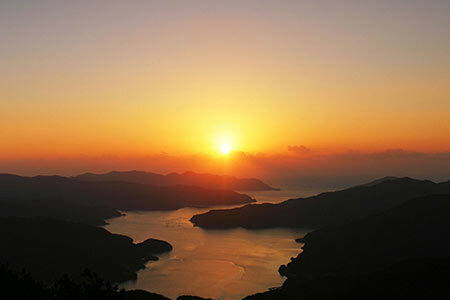 In the evenings, people gather here for the stunning sunsets over the water. 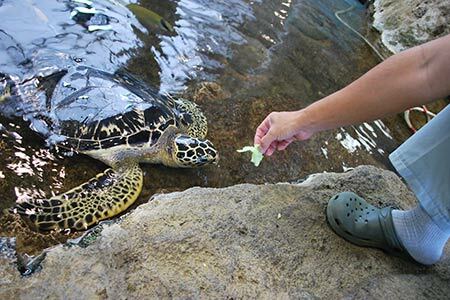 In Ohama Seaside Park, you can feed baby turtles at Amami Aquarium, soak in heated indoor and outdoor pools at a spa called "Thalasso Amami no Ryugu," and enjoy a meal at a fancy Italian-Japanese restaurant. 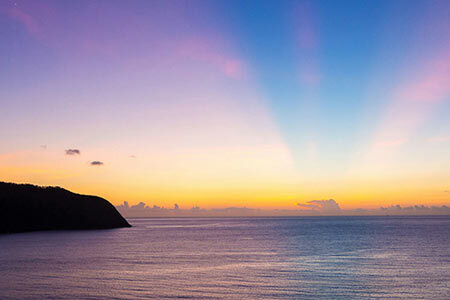 Kuninao Beach is a great spot to watch the sunset. 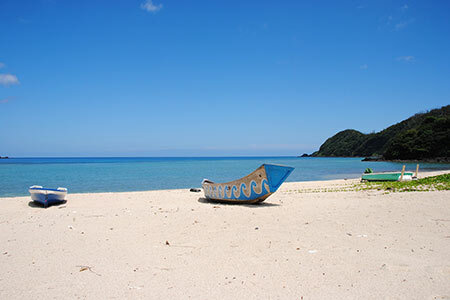 Marine sports such as surfing, SUP (stand up paddle) and diving are also available here. 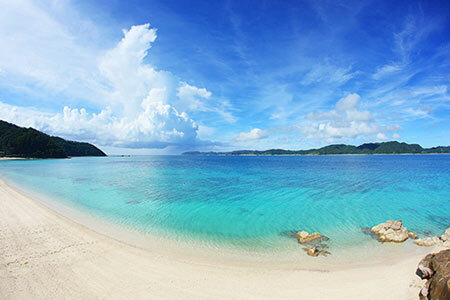 In early summer every year, many nature lovers gather to watch sea turtles come ashore to lay their eggs in the white sand. In this inland bay, the water is always calm. 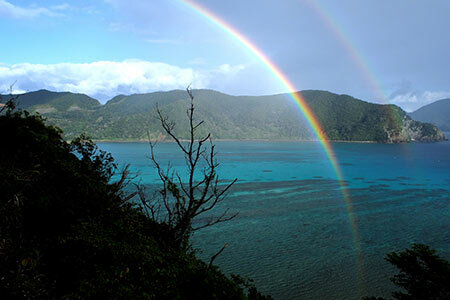 It's perfect for swimming, fishing and camping. 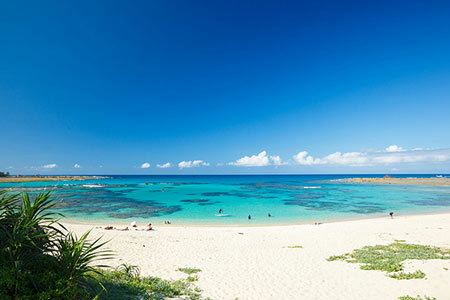 Throughout the year, many athletes come to this area for training camps. 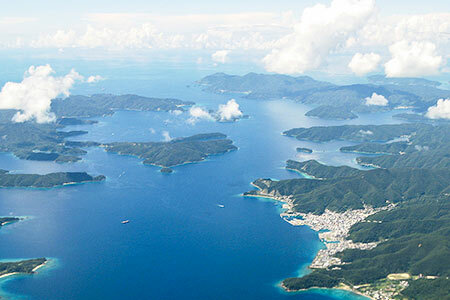 The long stretch of deeply indented coastline bordering the calm waters of Oshima Channel is an impressive sight. 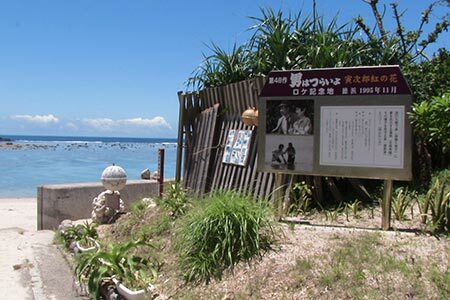 During WWII, Oshima Channel became a battlefield between Japan and the US, and there were many Japanese military ports on both sides of the channel. 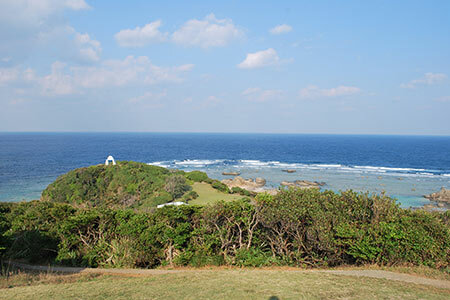 Many Japanese battleships and US fighter planes lie calmly on the bottom of the channel. 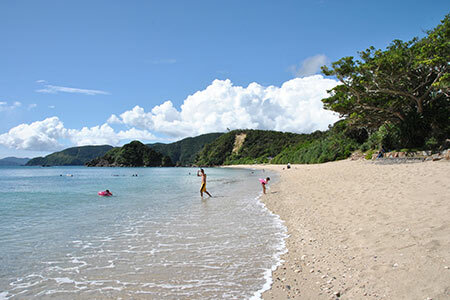 Honohoshi Beach is truly unique. 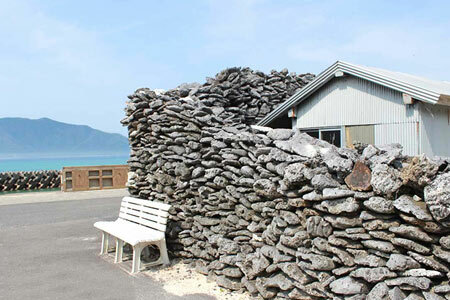 Constantly exposed to rough waves, its shore consists of thousands of large, dark pebbles worn smooth by the sea, with a few white coral pebbles mixed in. 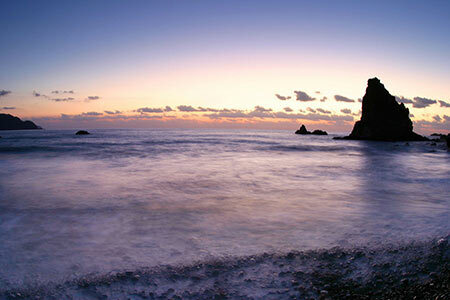 It is said that the sound of the waves raking the pebbles back and forth is "honohoshi." 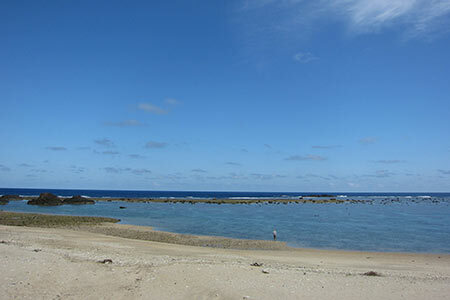 At low tide you can sometimes go inside a hollowed-out rock "cave." 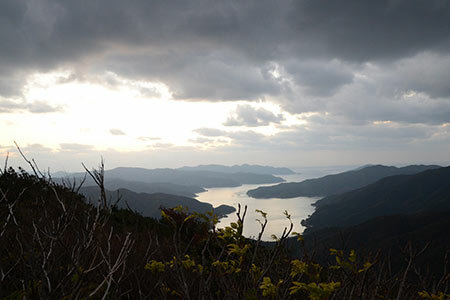 Honohoshi's wild beauty will remain in visitors' hearts and memories long after they have left. 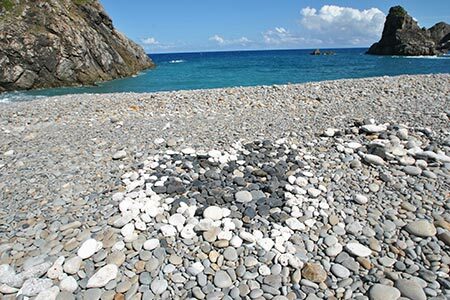 Many people use the pale coral pebbles to make a heart shape or spell out a short message on the beach and wish for love and peace. 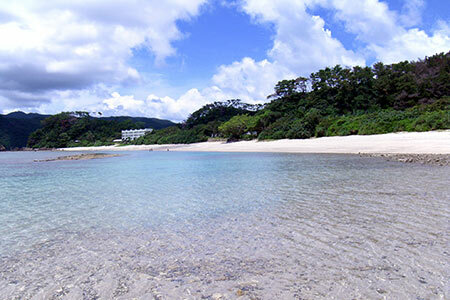 The polar opposite of Honohoshi Beach, Yadori Beach faces the peaceful Oshima Channel. 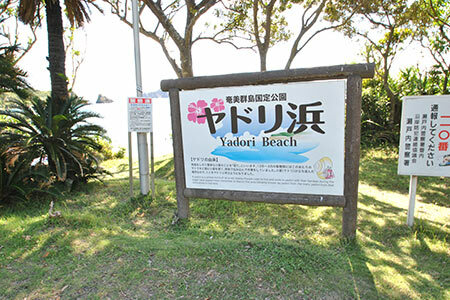 Yadori Beach's fine white sand and gently lapping shore is the perfect retreat for exhausted business people who need to relax. 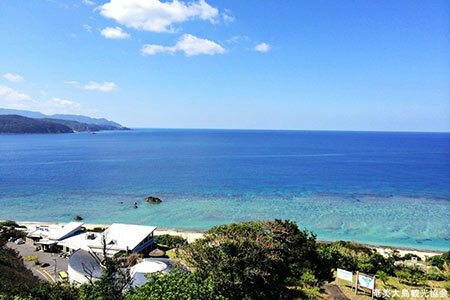 Overlooking the beach, "Hotel The Scene" offers luxurious overnight stays. 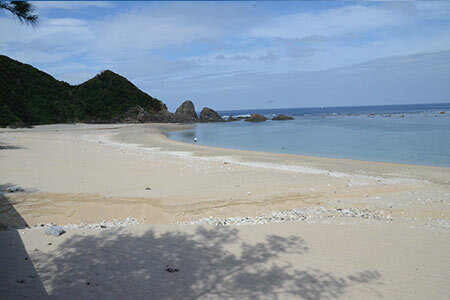 For outdoor lovers, basic camping facilities are also available. 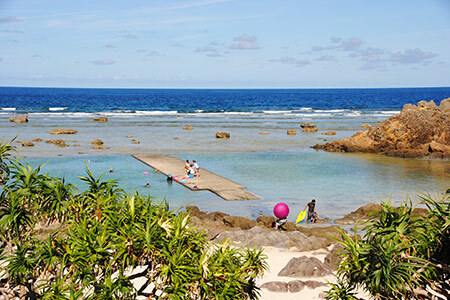 Located in the northernmost part of Kakeroma Island, Saneku Beach is legendary for its clear water. 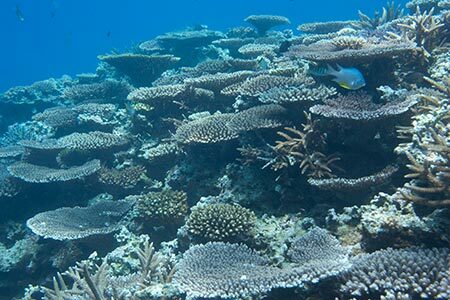 Although the island is sparsely populated, Kakeroma's stunning coral reefs and marine life attract many diving and snorkeling enthusiasts. 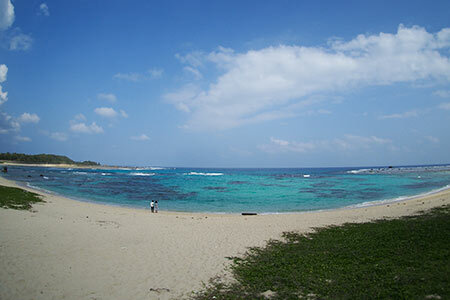 Tokuhama Beach is located in southern Kakeroma Island. 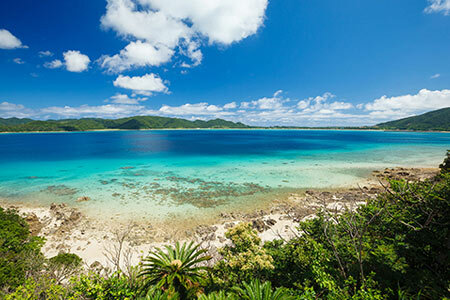 The area has no cellphone reception, making this remote beach a secret spot for divers and surfers.